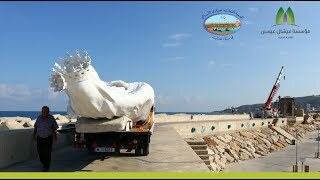 The Statue of Our Lady Of the Seas has finally reached its final destination on the top of Amchit Seaport as a result of the collaboration between Michel Issa Foundation for Local Development (MIF) and the Fishermen Cooperation in Amchit. In this occasion, a mass is organized on August 17 at 7:00 pm in the presence of Maronite Patriarch Cardinal Mar Bechara Boutros Rahi and Maronite Bishop of Jbeil Michel Aoun to inaugurate the statue and celebrate Virgin Mary's Assumption. Click here to know more, and Stay tuned to Michel Issa Foundation Facebook page.